Back in Slateholm, their packs lighter after selling loot, Tienarth’s Raiders were uncertain of where to adventure next. They only knew they wanted more wealth and more power. Remembering sights from trips aboard the ships that travel between Slateholm and Morgansfort, they began looking for information about the island fortress seen from the docks. The private retreat of the duke did not sound like a good choice for adventuring. Azrak qualified this though with a “yet”. Presently, a bare-chested barbarian with long blond locks approached and offered to buy them a round of ale to hear an offer. Inside the Dancing Toad, the barbarian explained the captain of his ship sent him into town to seek help. He’d heard of their band and a reputation for push back against the law. His shipmates, too, he explained had little respect for the law. In fact, his ship kept well away from Slateholm, unwelcome at the port. He asked the party to meet him at dusk to be transported to the ship. Anticipating adventure on the sea, the party made a few preparations during the day and eventually met the barbarian at the docks as the sun set. The barbarian Peadar rowed the skiff out to sea, the lights of Slateholm disappearing as the tiny lights of lanterns on a tall ship drew close. The thick night closed in on them as they pulled aside the ship and a rope was lowered. They climbed aboard one after the other to meet a lady both beautiful and terrifying, Captain Tawny of the Crimson Disgrace. The ship benefited from an advanced design unknown in the west, with sails able to drive the ship directly into the wind. Four mighty oars on each side stabbed in the churning waves. A large crew to match stood ready to row, set sales or fight. Captain Tawny described a once-sunken temple, now risen above the waves in the mouth of a river far to the south where jungle choked out all civilization. Their own attempts to raid the temple failed, but they knew great treasure lay beyond fearsome giant crabs, enough treasure for the entire crew to retire from their life of piracy. A quick negotiation concluded with a Tienarth’s Raiders promised six shares to four shares for the lovely captain. At dawn they set sail. It was a seven day journey to the south, staying within site of land always. The uneventful trip allowed for idle chatter. 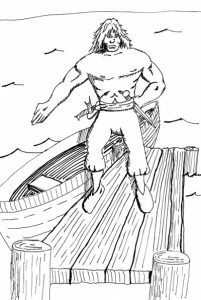 “Golden Teeth” Tindall, a bosun’s mate who earned his nickname by the despicable, yellowed state of his chompers, described a time in the past under the captain’s mother when the crew traded slaves captured in the barbarian north. The everlong war between the empire and the barbarians ruined that enterprise and they roamed far and wide, even farther east than the empire. They acquired the Crimson Disgrace and her unusual design in a far-off land. On the sixth day, a cry ripped through the morning mist. A tentacle as think as a tree trunk slammed onto the deck and wrapped around a sailor who’d been scrubbing the deck. Ghevont rushed forward, wrapping his arms around the tentacle, pulling it free. Chaos erupted as some men fled and other rushed into battle. In the end, a lightning bolt fired into the body of the giant octopus just below the water’s surface caused it to go limp and drift into the deeps, out of sight. In the afternoon, another octopus attacked. This battle was much more dire without the wizard’s powerful spells. The 2nd Mate, Malaki the navigator, was nearly killed. Most everyone on deck felt the sting of the barbs running along the tentacles, but they responded with wounds to the beast of their own. At a crucial moment, the octopus, flooded with fear, attempted to escape and was cut down with several blows. It too slipped back into the ocean depths. In the evening, a sailor in the crow’s nest spotted a merchant ship in the distance. Some debate rose up over a pursuit. In the end, the lust for the temple treasure won out over the uncertain loot transported by the merchant ship. Just after daylight, the shrine splashed by waves was seen near the mouth of a wide river. Thick junk grew up to the edge of a narrow beach. Steep stone stairs rose from a pile of seaweed-covered boulders to stone temple distinguished by three short towers. Giant crabs were seen moving among the rocks. The raiders made ready to row to the temple while the pirates waited on the ship. As a passing comment, Azrak told them not to worry if they were in the temple for three days. The party rowed towards the crabs with another boat carrying four pirates beside them. Not wishing to expose themselves to undue risk, the party tried lobbing flaming oil at the crabs. Errant throws produced brief sputters of flame quickly extinguished by waves. Tienarth let loose a terrible web that held four of the six crabs in place. One retreated up into the temple. One slipped down under the water. They pulled closer and destroyed those four trapped crabs with blows and fire. And now they considered their next step, likely to wade into the surf and climb the ancient stairs encrusted with barnacles. Drying seaweed drooped from the walls of the temple, limp after a lifetime below the waves. They could hear the lone crab above them clacking its claws.